It’s rare that an interview host does his homework, reads the book, and writes insightful questions. That’s why I was so pleased when Mark Hirsch, host of Growth Harmony’s Brain Trust Mastermind. came prepared with interview questions about my new book, Retention Point. In fact, the questions were so good that I decided to share Mark’s questions along with my answers for you here. Today, it is my pleasure to welcome our special guest, Robert Skrob. Robert is widely recognized as one of the world’s top member retention specialists. He started out in nonprofits and has helped for-profit companies in hundreds of niches transform customer relationships from “one-night stands” to long-term relationships. 1. Tell us a little more about yourself. What’s your background, and how did you become experienced in membership marketing? I’ve been creating and growing membership programs for more than 25 years. I launched a program in 2006 that I sold in 2012. Since I’ve been working with a small handful of clients helping them quickly scale their membership subscription businesses, engage with customers, deliver on their promises, and verify that everyone who is supposed to be paying them actually does. My clients include SAAS companies, nonprofit associations, large publishers, internet marketing types, and subscription boxes. 2. 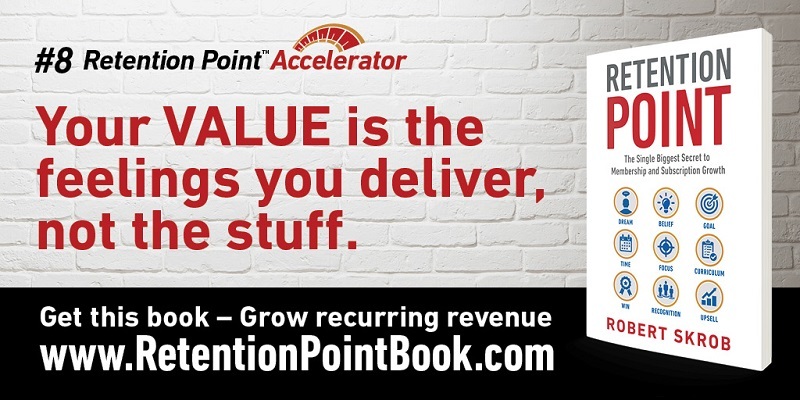 You have a new book coming out called Retention Point: The Single Biggest Secret to Membership and Subscription Growth. What was the inspiration behind writing the book? I wrote the book out of frustration one day because few people understand memberships. They may be used to selling products. They do a little updating on their order form to make what they sell a monthly subscription, they feel like a rock star for a few months as the program grows, and then they wonder why their member numbers plateau after a few months. Finally, they shrug and think that’s how people are. Fact is we are in a world-wide surge in membership and subscription programs. I can distinctly remember in 1999 when people would give me all of the moral reasons why they can’t pay monthly continuity payments and why I’m going to hell for offering it. Today, many customers prefer monthly payments. Frankly, anyone can sell memberships, and many do. Trouble is, few understand the differences when it comes to the delivery. I wrote the book to dispel the get-rich-easy myths around the surge in popularity and to provide a road map to those brave souls who, in their heart of hearts, really want to run a membership business in the right way so they can skip by the plateaus and grow their business. 3. So why should every entrepreneur be concerned about membership marketing or membership retention strategies? I had a potential client approach me last month. He has 50,000 members paying him each month, generates 10,000 new members a month on average, but loses 9,500 per month. Kudos to his team for generating 10,000 new customers; that’s awesome for any business. But damn … Every month, his company is disappointing 9,500 people at the same time. He spends 95 percent of his monthly marketing budget to replace customers he started the month with. His marketing team works 27 days a month to replace customers who quit and only 3 days on growth. Is that any way to grow a business? The whole point of creating a membership program is that you have a group of customers who have preapproved your charge and are eagerly excited about what you are going to ship this month, whether that’s your SAAS product, supplement, newsletter, membership site, or box. Too many people bring the hunter mentality into the subscription membership business. They make the business all about getting new customers to grow their numbers, but that never works. Instead, you need a “farmer’s” mentality where you do your marketing to invest in your customers; your deliverables are to tend to your crops, and you reap a harvest every month as your membership grows. 4. What is the difference between customers and members? It’s the difference between a girlfriend and a fiancé. Mark, what if I announce to you and everyone else that you are my fiancé? It’s a bit creepy, isn’t it? Before I can call you or anyone else my fiancé, that person has to give me their permission. Membership is similar. In a customer relationship, I give you money and you give me stuff. A happy transaction is one where each of us gives the other what we promised. When you make a habit of this, you’ll find it’s a whole lot easier than coming up with new products and promotions to launch all the time. 5. In Chapter 3, you mention Quitters, Lifers, and the Retention Point. Can you break down these concepts for the audience? How do they all relate? The Retention Point is all about communicating in a certain way with each of your new members during the first four weeks of their membership to transform more of your members from Quitters to Lifers. 6. One of your chapters dives into some of the mistakes Membership Marketers make that prevent them from achieving membership growth. What are some of those mistakes, and how do we take action ahead of time to prevent them? There are five mistakes detailed in Chapter 5 of my book. The most ridiculous one has never been shown to improve retention, yet it’s the most universally believed and repeated idea: Send members a gift of food to make them feel obligated to stay. I so wish this worked. It would make my life a lot easier. Your member didn’t join because they needed cookies or a box of brownies. They joined because they had a problem and thought your membership program might be a possible solution. Retention over the next 30 days will be determined more by whether you can help your member solve their burning problem than whether you send them stuff they didn’t want and never asked for. There’s a great story about all this in the book, but that’s the core fallacy behind the logic of giving a gift of free food to create a feeling of obligation through the persuasion tactic of reciprocity. Reciprocity does work, but only after you’ve created trust with your member. 7. What are some myths subscription companies believe that kill membership growth? The “content is king” advocate who focuses so much time and attention on what they deliver that they take their focus off of their members. The Membership Marketer who focuses too much time and attention on their promo and not enough time on the product that comes next. The publisher or author who works so hard to craft the perfect book without considering how the content will impact a reader. The SAAS company that pours money and time into developing their software but doesn’t understand the problems their subscribers have that their software will solve. The subscription box entrepreneur who spends all their time curating a box and forgets about subscribers. 8. What are your best tips for converting free trials into long-term paid memberships? Move the finish line. Rather than celebrating when you get a new free trial member, instead set your goals and scoreboard to celebrate how many new members you have that make two payments with you. These are members who start the free trial, begin by paying for membership, and then make another payment (either because they renewed their membership or purchased something else). When you move the finish line and set your goal to get your newest customers to make two purchases from you, you’ve suddenly changed the game entirely. Now you’ll be playing the game not to grab a bunch of one-and-done customers but to be focused on building long-term relationships. 9. Overall, what do you hope readers take away from reading Retention Point? Membership growth comes from retaining your members, not from getting new ones. 10. Could you share the 80/20 of top tips that improve LTV? The 20 percent of the work generates 80 percent of the results. When time and resources are limited, I always start my clients with a new member nurture email sequence. It’s much like a follow-up sequence to convert a lead into a buyer, but it’s written for new buyers to convert them into Lifers. Together, we chart the transformation, outline what customers must believe to become Lifers, and document the Member On Ramp — what new members must know to get up to speed. Then we create a series of emails to deliver that. This creates enough of an impact to prove the concept, free more resources so we can create member welcome videos, update deliverables as necessary, and tweak their new member recruitment process. 11. Any conversion-rate hacks you could share with us? The gift with purchase is my secret weapon. Department stores still use the gift with purchase to drive sales at their cosmetic counter. For Mother’s Day, my wife often sends me to buy some particular product because she knows it’ll cost enough for her to also get the “free” gift. This way, she gets what she really wanted. When you design a Member On Ramp that helps your new member solve an important problem in their lives, in addition to being a great way to engage and retain your member, this also becomes a “free gift” you can offer your member to encourage them to join. In Retention Point, I show an example from No BS Inner Circle. Their onboarding product gives members the nine most effective marketing strategies to generate new customers fast. This is a great Member On Ramp because it delivers a quick win for new members. Now that we built it, this product is also a terrific free gift to offer new members to encourage them to join. When you design a great Member On Ramp to help you keep your members longer, it can also become a conversion-rate hack to help you generate more new members as well. This is yet another reason that focusing on retention helps you grow your membership faster; your membership becomes more enticing to new members. Is Retention Point right for you? If you’ve learned anything here today, there’s a lot more for you in my new book, Retention Point. In this book, I outline step-by-step exactly how to create your new Member On Ramp to retain your members and grow your membership. Head over to Amazon.com now or visit www.RetentionPointBook.com to grab your copy today. I just bought your new book on Prime! I can’t wait it sounds superb!